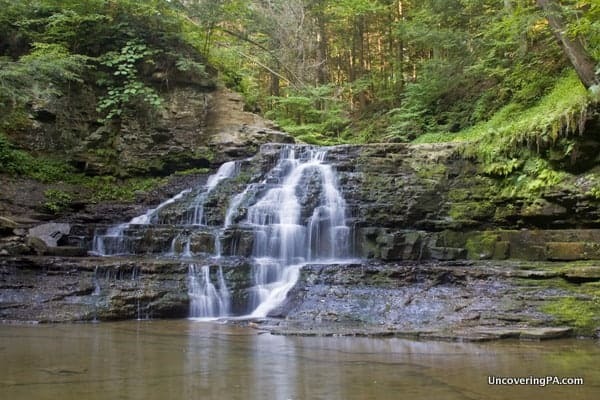 Throughout Pennsylvania, there are many hidden creeks that entice waterfall lovers. Hiking along these streams, hidden waterfalls come into view. 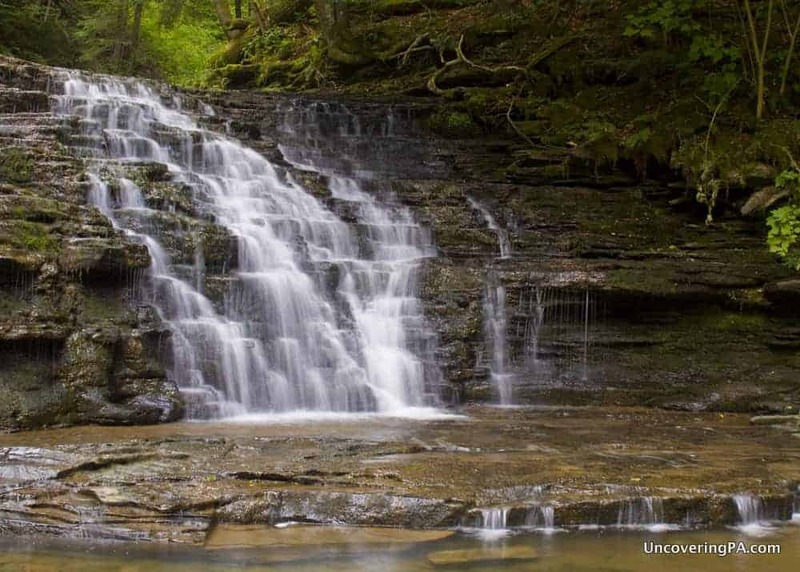 However, to reach these hidden waterfalls, you have to hike where there is no path and often climb the waterfalls or steep banks to continue on your journey. In many ways, this is exactly what the Fall Brook Trail at Salt Springs State Park in Susquehanna County is like. 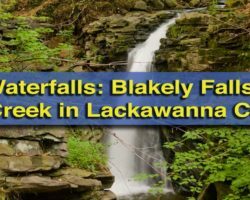 However, unlike creeks like Miners Run or the waterfalls of State Game Lands 13, where hiking up along the creek is a rather difficult task, the hike up Fall Brook is quite easy and very fun. 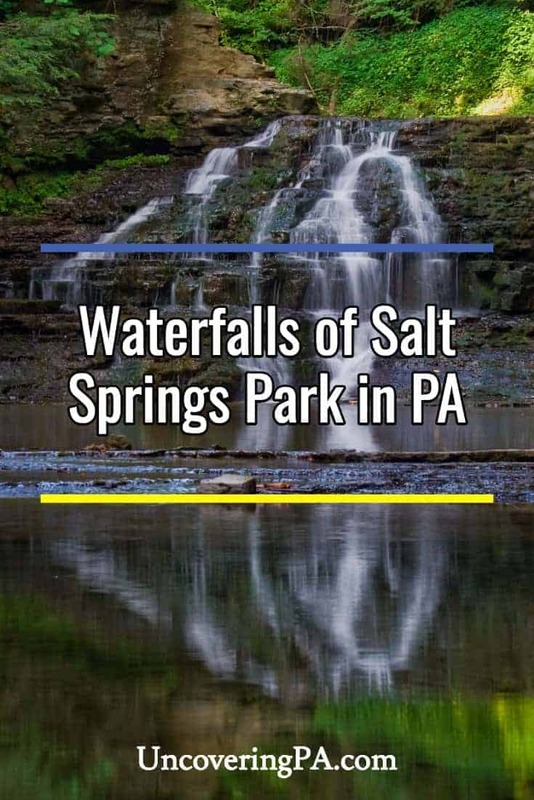 Salt Springs State Park is the only state park in Pennsylvania that is primarily run by a non-profit organization: The Friends of Salt Springs Park. The 850-acre park has miles of trails and some interesting history. 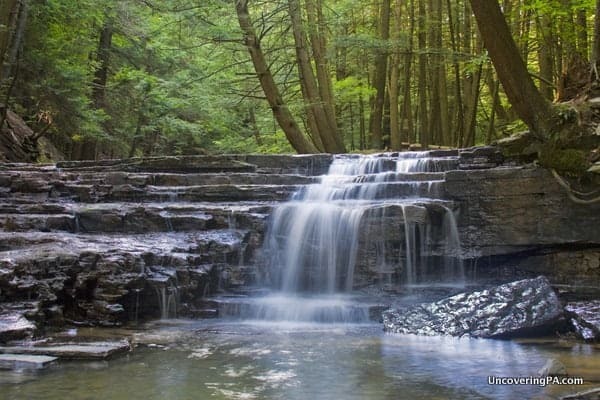 However, most visit to see the beautiful waterfalls along the Fall Brook Trail. The Fall Brook Trail starts from Wheaton House, which is where the park offices are located. The trail crosses a short bridge over Fall Brook before turning upstream to follow the creek. 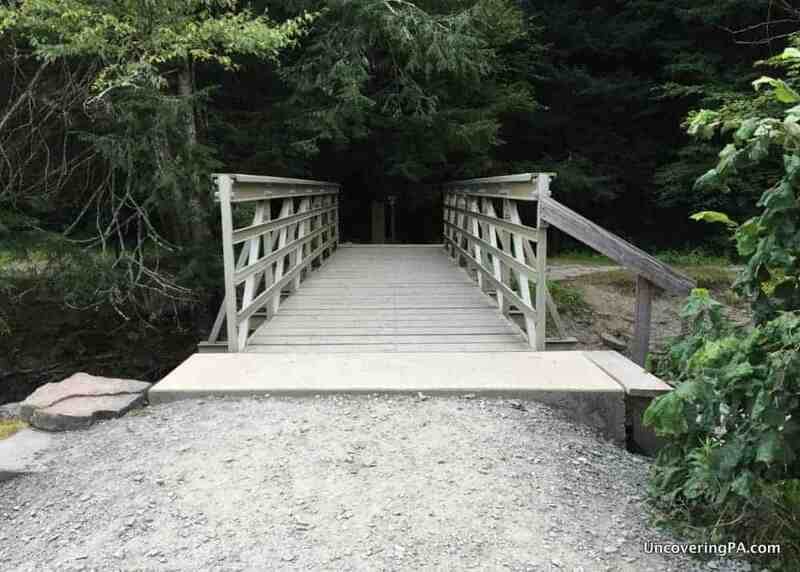 This bridge over Fall Brook is the start of the Fall Brook Trail. From the bridge to above the third waterfall, there is no real trail for the entire half-mile hike. Sure, there are places where the bank has an obvious path, but it’s often easier to just go straight up the creek. While the water was relatively low during my early August visit, I was able to wade the creek without going in water more than about a foot deep. 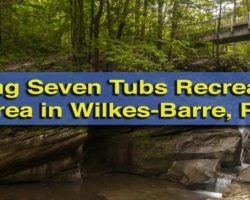 For those hoping to cool off in the creek, there are no obvious swimming holes, and even the water directly under the waterfalls didn’t exceed more than a couple of feet deep. I have seen information that there might be a swimming hole upstream from the third waterfall, but haven’t confirmed this myself. Approaching the first waterfall along the Fall Brook Trail. 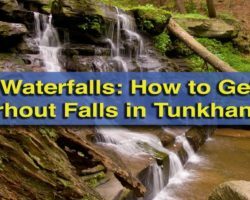 After about five minutes of hiking, you’ll come to the first waterfall on Fall Brook. The tallest of the three, this waterfall is roughly 15 feet tall, and cascades down the rocks in a series of steps. There is a rock shelf directly under the waterfall, meaning you can walk right up to the falls and barely get your feet wet. Of course, if you do this, use extreme caution, as the rocks can be somewhat slippery. The first and tallest waterfall along Fall Brook in Salt Springs State Park. 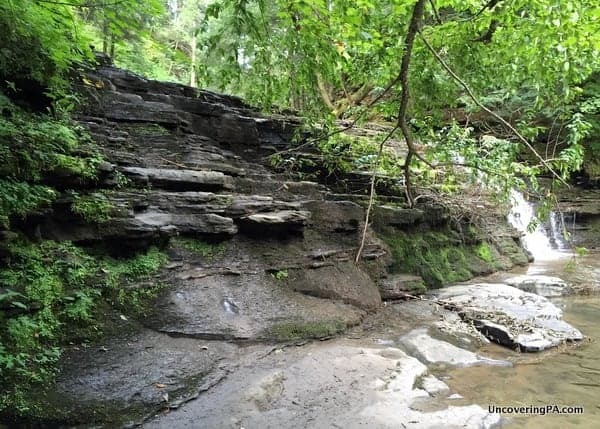 When you are ready to continue upstream from the first waterfall, take a minute to look around for the trail. That’s right, there isn’t one. Instead, you have to hoist yourself up the left side of the waterfall. Truthfully, except in times of very high water, this is quite easy. The natural steps in the rock are usually very dry, and, aside from a very large first step, there isn’t much of a challenge here. The Fall Brook Trail continues straight up the side of the waterfall along the rocks in this photo. Once atop the waterfall, you’ll see the second waterfall of Fall Brook less than 200 feet upstream. This waterfall is very similar to the first one in appearance, but is a bit shorter with a more spread out flow. There is a small pool below this waterfall, but when I was there, it was less than 18 inches deep. The middle waterfall along Fall Brook as seen from near the top of the first waterfall. You’ll likely notice as soon as you climb up the first waterfall that the rocks on the edges have been carved out by the stream. Fall Brook Gorge is one of the most unique I’ve come across in Pennsylvania, and definitely creates some interesting rock formations. It is said that the flow of Fall Brook was altered by retreating glaciers during the last Ice Age. As the water passed through this new area, it removed the rocks, until the hard sandstone was left. The sandstone then broke away in blocks, creating the carved step appearance along the gorge. A closer view of the middle falls along the trail. After you’ve enjoyed the second waterfall, you have two choices. If you again look to the left of the waterfall, you’ll notice a narrow path going steeply over the ridge. I was a bit surprised at the narrowness and steepness of the path, but it is one option. The second choice is to again climb up the waterfall, though this time along the wet rocks on the edge of the falls. While this might not be the best choice when waterfall levels are higher, I chose the second option and had no issue with slippery rocks. The two smaller falls that make up the third and last waterfall on Fall Brook. The third waterfall along Fall Brook in Salt Springs State Park is a bit further upstream. This is the smallest of the three. In fact, the two small falls here could almost be considered two separate waterfalls, but given their proximity and size, I’ll count them as one (as the park does). Once done with the third waterfall, the Fall Brook Trail does continue along the creek, should you wish to continue. However, since there are no more waterfalls, I opted to head back. The upper tier of the last waterfall in the Fall Brook Gorge of Salt Springs State Park. To get back to your car, you can simply go back the way you came. However, I wouldn’t recommend this, as going down the waterfalls is likely to be much more difficult that going up them. Instead, look to the hill on your left. Along the top of the hill, slightly behind you, is a platform. This is a viewing area for the waterfalls. While there is no official trail, there are several worn paths that will take you up to the top without much trouble. At this observation platform, there is signage about the formation of the waterfalls and a nice view of the last waterfall. Head along the wooden boardwalk, turning left at the split. 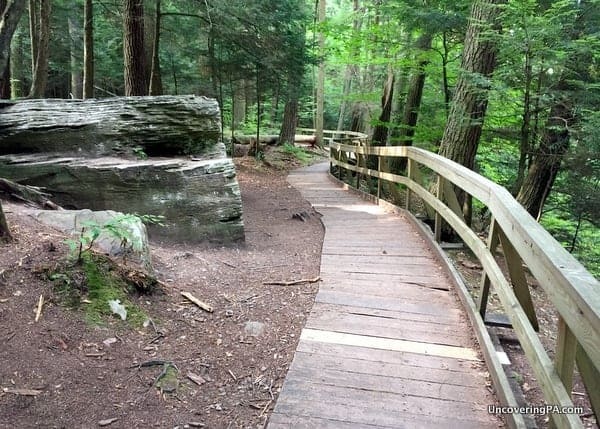 The boardwalk that makes up part of the Hemlock Trail. You’ll pass several more signs before coming to the end of the wooden walkway. Just before the end, you’ll pass Penny Rock. For reasons lost to history, it is said that if you hammer a penny into the rock, you’ll have good luck. Either way, it’s fun to look at the pennies that have been left here by previous visitors. 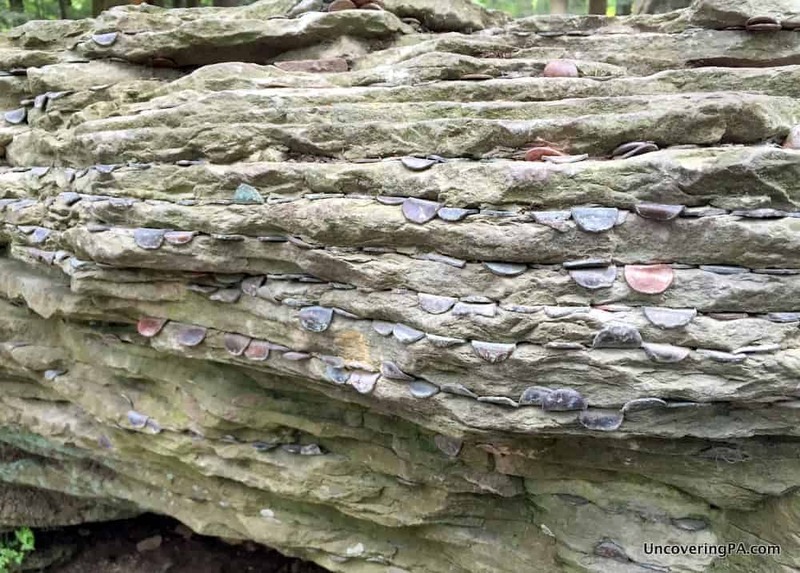 Many people have hammered pennies into Penny Rock along the Hemlock Trail. From here, the trail continues downhill back towards where you started. While it isn’t very well marked, following this trail (marked as the Hemlock Trail on Salt Springs State Park trail maps) is easy enough. In around 10 minutes, you’ll find yourself back where you started. I really had a great time hiking the Fall Brook Trail and Salt Springs State Park. 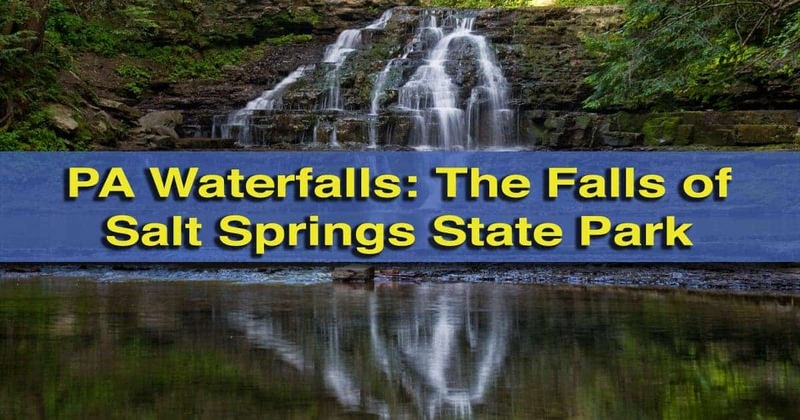 While the total hike is only around a mile, it goes past three beautiful waterfalls and includes a lot of fun with Salt Springs State Park hiking through the creek and up the waterfalls. Hemlock Trail isn’t very well marked, but isn’t too difficult to follow for the short distance back to the picnic and parking area. 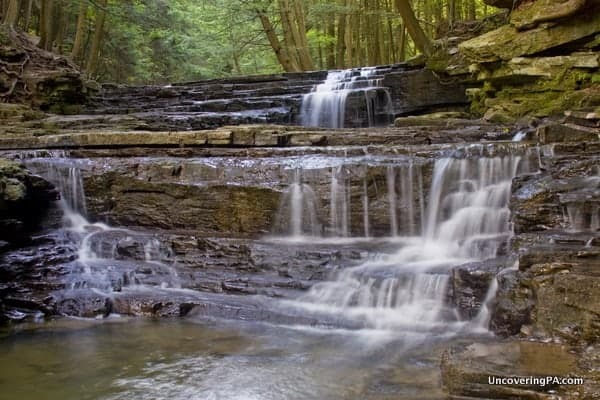 If you’ve always wanted to explore one of Pennsylvania’s great trail-less waterfall creeks, but the thought of the difficult conditions intimidates you, then Fall Brook in Salt Springs State Park is a great choice. 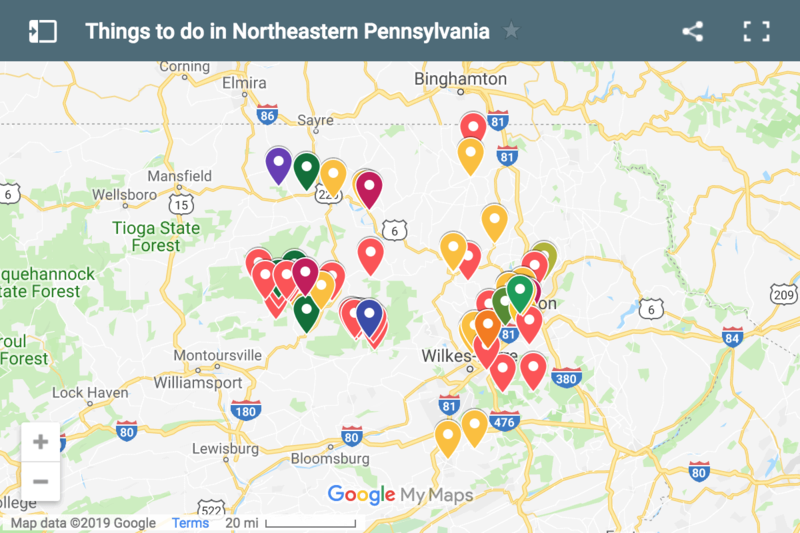 Want to see more in the area? 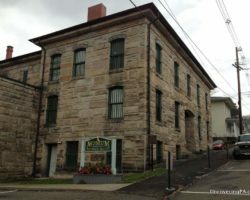 Check out the Susquehanna County Historical Society Museum. 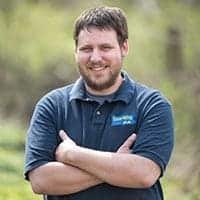 I’m searching for some kid-friendly falls in the PA area. 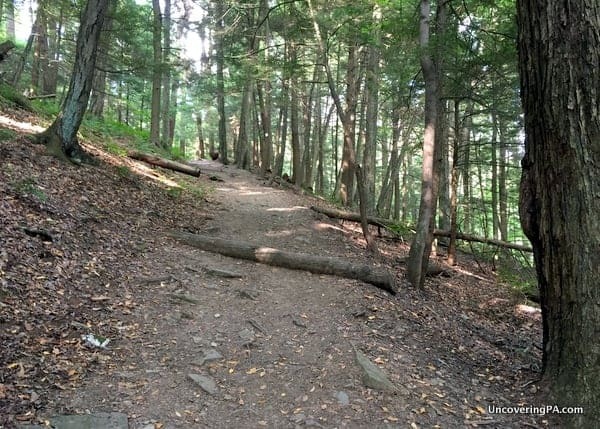 We have 9 kids, ages 1-14yo, so the trails would need to be on the easier side and preferably strollerable for parts, or at least hikable with a baby in a backpack. We are an avid hiking family, and 5-6miles is easily accomplished by my 4yo and up. Any suggestions? 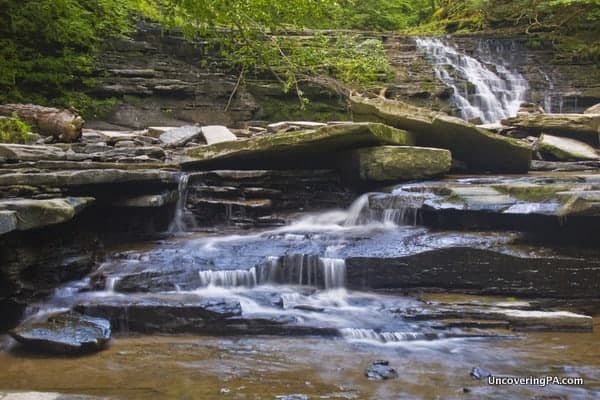 Ohiopyle Falls and nearby Cucumber Falls in Southwest PA is easily observed from several areas, and there are many other attractions and places to hike in the area. Fayette County. 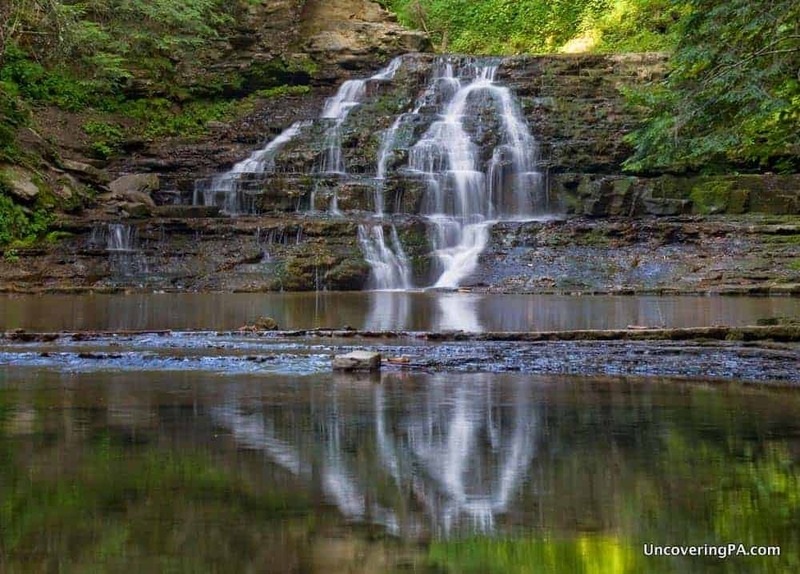 Looking for waterfalls to photograph in Pennsylvania.